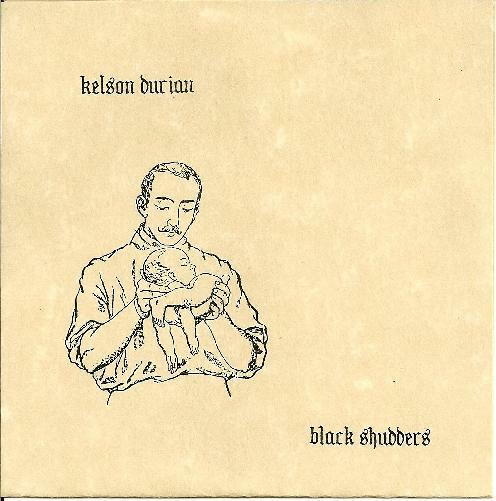 Kelson Durian - "Black Shudders"
Not much info here, but KD is apparently one "J. Brown" and this is a 200-pressed CD-R of seven untitled tracks averaging only about two minutes in length... starts off great with track #1, very ethereal banjo played against a bass-pulse and some other subtle effects. #2 uses drums to accompany acoustics and weird whistle sounds. These middle tracks aren't the most scintillating... but the last few are quite great and also the most melodious. #5 is a mournful and very pretty banjo riff, #6 a pleasant bass-line accompanied by shaker and delicate guitars (though it falls a little off-kilter a couple times). #7 is trippy psychedelic folk with lots of layers and strange chaotic noises that play nicely against the rhythm. Definitely for fans of the Camera Obscura label and dark avant-folk in general. Creepy surreal artwork, too. I wonder what else Mr. Brown has going on?